Middle Eastern food is being prepared in Austin and its suburbs in mom and pop cafes, food stands, established eateries, fancy restaurants, hipster food trucks, alongside hookah parties, tucked into strip malls, parked beside gas stations-- ALL OVER the place. It may take departing the beaten path a bit, but I'm here to assure you that there's a robust Middle Eastern food scene in Austin and I encourage you to venture out for a bite of the best. Middle Eastern food-- its customs, flavors, ingredients, varies from region to region. It is rich and diverse with tradition, culture, religion, and geography playing important roles at the dinner table. The hummus/houmous/humus/hommos you eat in Iran may not be the hummus/houmous/humus/hommos you enjoy in Turkey, yet every spelling is correct for the ubiquitous chickpea/tahini/olive oil spread. The Persian restaurant you visit may have your familiar falafel to keep the customers satisfied, but their specialties will be various types of khoresh, or stew. The more I learn, the more I discover how much I don't know. My research has become an obsession. I've always been drawn to the common flavors of all of the Middle Eastern regional cuisines-- the bright lemon and sumac, the fresh mint, parsley and coriander, the occasional slow sting of peppers, the aromatic cardamom, cinnamon, turmeric, and cumin, the creamy sesames and full flavored tangy yogurt, the nutty basmati pilafs and mellow saffron. I enjoy the crisp bulgar wheat, the buttery pine nuts, the savory stewed meats, the slightly gamey lamb, the spit-roasted beef and chicken, the exotic orange blossom, rose, pistachio and pomegranate. If you're reading this now, chances are you've taken a shine to them, too. Or you're at least curious. And that's great. 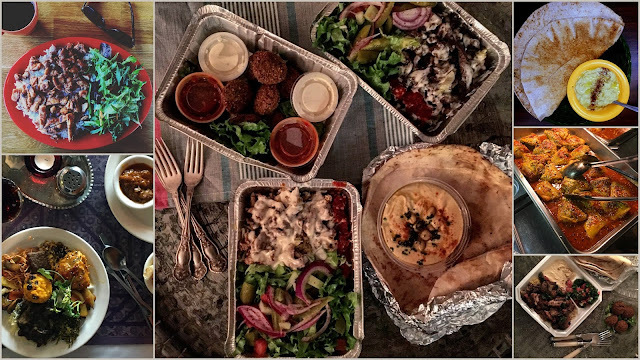 Below, find my favorite brick and mortar spots, and at this link, a quick list of Middle Eastern food trucks peppered around town to begin, or continue your exploration, you culinary adventurer, you. Enjoy a leisurely lunch, because this bountiful, economical buffet is available until 4pm, with dinner served from the menu, afterwards. Currently craving: sour cherry rice, or Albalu Polow, Persian-favorite Gormeh Sabzi, an herb and beef stew with kidney beans and dried lemon, creamy, fragrant rice pudding, Sholeh Zard. Currently craving: The most amazing pita I've ever had in my life, piping hot and steaming as it reaches the table, stuffed with crisp-edged Chicken Shawerma. Hours: Open 11:30-2:30 and 5-10 M-F, all day Sat. Closed Sunday. Tucked into a corner strip mall, this jewel is worth the trek. Vegan friendly, and devoted to serving nutritious meals honoring principles of food as medicine. They were the brightest surprise in my research, delicious, and darned nice folks, to boot. Currently craving: Must-o-Mousir a tangy yogurt and young shallot dip served with flatbread, the vaguely sweet Fesenjan, chicken, stewed in a pomegranate walnut sauce, and mellow saffron'd rice embellished with pomegranate. An affordable option for trying a variety of Lebanese and Mediterranean specialties, this Texas chain offers an all day buffet. Currently craving: Perfectly crusty falafel, lemony-fresh tabbouleh, smoky baba ghanouj, fall-off the bone lamb shank. And seconds on every salad. Brick oven pita right in your face. See website for mobile locations downtown. The life of the party, these guys offer a munchy-friendly menu for some of the best late night eats on the East side. If you're in town for a festival, keep Kebabalicious on your radar. Currently craving: The Mezza platter if I'm sharing, Saffron Rice Bowl with lamb, and Boss Fries. That Ka-Baam sauce, aptly named, is the bomb. International groceries, prepared foods, a bounty of the best briny olives in town, and a deli with no sandwich over $5. Take-out, only, and a second location north, on Burnet Road. 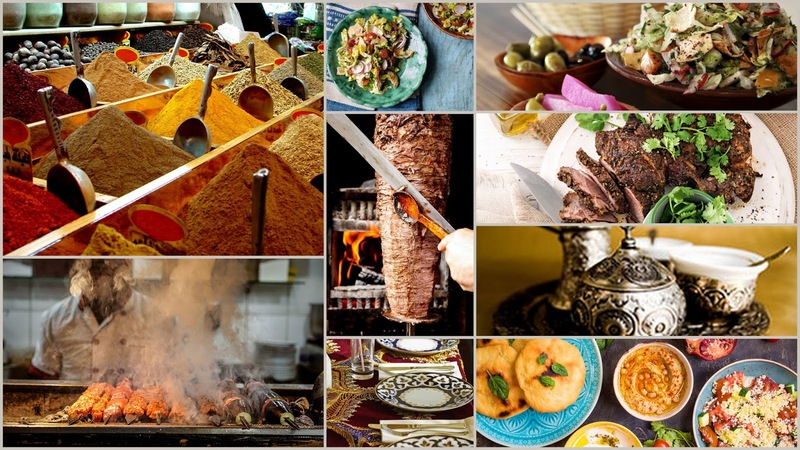 Currently craving: a Chicken Shawerma wrap with garlic sauce subbed, outstanding Kibbeh when they have it, that lemon mint Tuna White Bean salad from the case, a tiny sugar-dusted square of Turkish Delight, and pickled turnips from the shelves. The over-the-top exterior is hard to miss just off I-35, bordering the jumping Rainey Street scene, but inside find a warm welcome, and food prepared with care. Appropriately open late, so stumble on in and find your Lebanese and Mediterranean favorites. Currently craving: Phoenician Eggplant, topped with a cloud of tangy yogurt, creamy Baba Ghannouj, and a perfectly herbal Tabouli, heavy on the parsley and just the way I like it. This unassuming location in north central Austin is an insiders favorite for Persian specialties, and a few Mediterranean standards thrown in for good measure, Hospitable owner/husband and wife team that offer dishes cooked with care and pride. Currently craving: a tall glass of rose tea to wash down barberry, almond, and walnut-studded rice of Zereshk Polow, and it's herbal-nuanced stewed chicken in broth, served separately. Spacious and bright cafeteria style eatery popular for gracious hospitality and a wide variety of dishes offered from every Middle Eastern region, shares equal space with an impressive bakery chock-full of Middle Eastern sweets. Currently craving: a little bit of everything, like the Vegetarian Platter, offering as many as 15 samples of salads, sides, and dips. Family-owned South Austin favorite serving Lebanese food prepared with pride by the owner and head chef. Hookah on the patio. 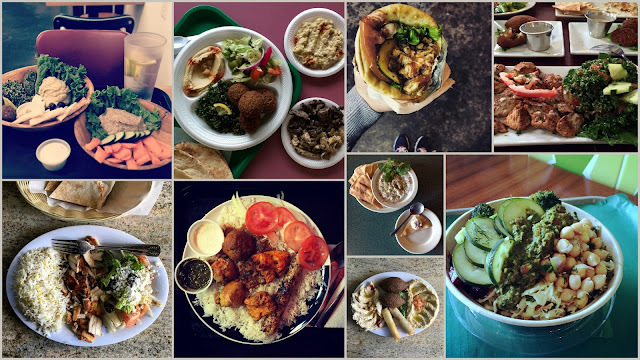 Currently craving: The vegetarian plate's homemade sesame-dotted Falafel, tangy Laban-Wi-Khiyar, Tabboulleh, and the very reason they've been included-- the best Baba Ghannouj in South Austin, An off-menu side of Chicken Shawarma if I'm ravished. Several Middle Eastern and a few fusion restaurants of note not named above, have loyal followings and satisfied customers, that for the most part include me. They deserve a very honorable mention, and a lengthier discussion and include in no particular order Shandeez Grill, Dream Bakery, Marakesh Grill & Cafe, Sarah's Mediterranean and Market, Arpeggio Grill, Athenian Grill, Phara's, Halal Brothers, Kismet Cafe, The Halal Corner, Troy, and Shahi Cafe. If I've missed a treasured corner cafe or diamond in the rough, please chime in! You may also be interested in branching out from exclusively Middle Eastern cuisine into local Greek and Mediterranean establishments which include Santorini Cafe, Tino's Greek, Opa! 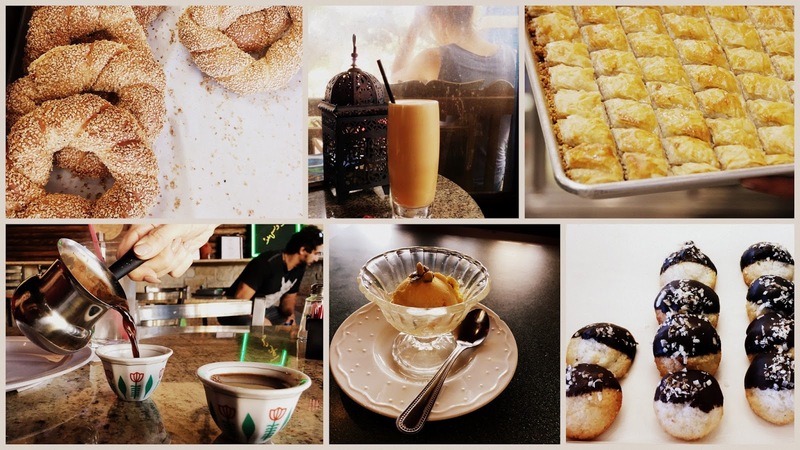 Coffee and Wine Bar, Plaka Greek Cafe (Georgetown), The Mediterranean Chef Cafe, Zoe's Kitchen (national chain), Milto's Mediterranean Cafe, and Cafe Malta. Looking to go mobile? Take a look at the many Middle Eastern food trucks concentrated primarily in the center of Austin. 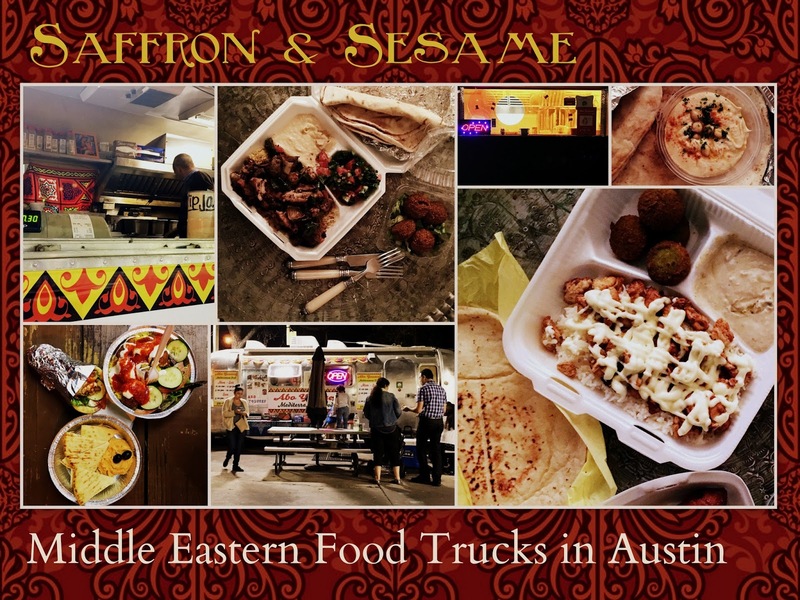 Great options for grabbing a meal on the run while touring the city can be found at Saffron & Sesame | Middle Eastern Food Trucks in Austin. Be sure to check out the entirety of the #ATXBESTEATS AFBA City Guide to the Best Places to Eat in Austin where savvy local bloggers give you the skinny on almost every restaurant, cuisine, and favorite food experiences in Austin.